Last year was my first visit to one of the southern United States largest comic and pop culture conventions. I was very excited about a new show coming to Disney XD called DuckTales (you may have heard of it). In my excitement I took a chance on reaching out to Tad Stones to thank him for Darkwing Duck and Rescue Rangers. Like many others my age, I was a huge fan of cartoons when I was young. We grew up during a great time for cartoons. We had Saturday morning cartoons, weekday afternoon blocks, and VHS tapes filling “entertainment centers” in our family rooms. The shows that made up the early days of the Disney Afternoon were some of my all-time favorite cartoons. So when I came across the DVD sets of these shows I immediately began purchasing them and sharing them with my kids. I was very surprised when Tad responded to my communication and we had a conversation. I was star-struck and in awe that the man who had created some of my all-time favorite childhood characters was willing to spend time talking with me about his experiences. After that conversation I was determined to purchase some of his original art, and that was when he told me that he was visiting the southeast at Dragon Con over Labor Day weekend in 2017. I had heard of Dragon Con before. In 2001 I was part of an online community that existed on a message board forum (pre-social media) called Freedom Reborn. The message board was centered around a PC RPG video game called Freedom Force. I had a lot of fun online with this group and I knew a lot of them would visit Dragon Con every year. But I never went. Looking back, I regret that now. In 2017 I decided that my family and I would meet Tad, and we planned our first trip to Dragon Con. That first trip was a lot of fun, and we enjoyed the experience immensely. Meeting Tad was great and he was just the same in person as he was online. He signed my Darkwing Duck DVD and my Definitively Dangerous Edition TPB. I also had the pleasure of meeting Amy Mebberson and James Silvani at that convention. James was the main artist on the Boom! Studios and Joe Books’ Darkwing Duck comic series, and Amy was doing the art for the Joe Books’ Disney Princesses comic. We bought some great artwork and comics. My girls wanted to see (and touch!) everything James and Amy had out, so I was sweating bullets trying to keep them from destroying their tables. My experience at Dragon Con 2017 was a great one, and it was that experience that kind of drove my desire to start a podcast with my buddies about the DuckTales reboot and the Disney Afternoon. I was delighted to see the Darkwing crew would make it out to Dragon Con again this year, and I began planning a trip that might include some content for DuckTalks. Working with Dragon Con’s Media Relations Team was a blast. They were quick to respond to my inquiries and they were willing to help me set up some interviews with some of the attendees. Unfortunately, I had somewhere that I absolutely had to be on Friday of the convention, and it took too long for me to iron out the details of my trip. So I missed the window to schedule those interviews (maybe next year). At that point my plans changed, but I was looking forward to braving Dragon Con on the busiest day of the convention, Saturday. I had some issues getting there on Saturday morning (parking and my train ride into downtown took me two hours!). But after a little confusion I was able to pick-up my pass and head back into the sea of cosplay. You can read more about Dragon Con in my recent blog. I am going to focus more on my experiences in this blog. My first stop was Comic and Pop Artist Alley! I worked my way through the first floor of AmericasMart Building 2, and realized it would take me hours to see everything on my way to the Alley. So I took the escalator in the back of the building to the fourth floor. A couple of rows into the floor and I noticed two tables that were covered in Uncle Scrooge and Donald Duck prints. Seated at the table was Don Rosa. Now, I need to add here that I missed Don at last years DC. I wasn’t overly familiar with his work at that time, and we had not yet started DuckTalks. I knew he was the creator behind “The Life and Times of Scrooge McDuck” but that was really all I knew. But this year I realized how fortunate I was to have a few minutes with a man who has penned some of the greatest Disney Duck stories ever read. People in Europe spend hours in line to meet Don Rosa… Honestly, I was a little nervous. I walked up to his booth debating whether to act as a casual convention attendee who was interested in his work, or the Disney Duck loving fanboy that I really am. Unfortunately for me there was no one else at the table to allow me to decide what I should do, and I just went for it! I introduced myself and expressed that I was a new fan of his work. The shear amount of amazing prints at his booth was overwhelming and although I wanted to take the time to speak with him, I also wanted to spend time examining the artwork as well. He had his “notorious” sign on his table and when I brought attention to it he pointed out that it was a misconception that he didn’t like DuckTales. He thought it was a very good cartoon, and possibly the best on television. I told him that it was the original show and the reboot that sparked an interest in me to do a weekly podcast that would lead to me finding his work and becoming a fan. After a few minutes there were others gathered around appreciating his work (and the sign… a lot of people stand back and read the sign and giggle). I told him I was going to look around, but that I would be back to purchase a print before I left. I did return a few hours later and I did wait in line for a Don Rosa signature. It may not have been 6 hours like our friend Morgann, but I was happy to watch as others enjoyed conversations of chiles (I dare you to call them peppers in front of Don!) and purchased prints from one of the comic greats. If you ever have an opportunity to attend an event where Don will be signing you simply have to make time for it. He has attended Dragon Con for several years, and I hope to return to his booth again next year. After my first experience with Don Rosa, I went looking for the Darkwing crew. Dragon Con’s Pop and Artist Alley is quite large and they were on the opposite end from Don. If you’ve never met them, they can usually be found together at various conventions across the US. James Silvani was setup on the end closest to the main walkway. He had his collection of books for sell, but I had all of those. I was mostly interested in thumbing through his one-of-a-kind convention head shots. While I was looking through his work he was hard at work on a commission of Lumiere and Cogsworth from Beauty and the Beast. He had so many great drawings to choose from, that I really wasn’t sure what I would select. I was able to have a conversation with James this time without worrying about my kids bumping the table. It was a hard decision, but I did select a 2017 Darkwing Duck headshot. I had every intention of returning later that evening to pick up one more (if it was still there), but that didn’t work out. I caught Tad Stones at a great time because I was able to walk up and talk with him immediately. The rest of the afternoon I watched as a short line stayed consistent in front of his booth. Tad had a selection of smaller cards available for purchase. I had been watching his Twitter feed for over a week as he shared his progress on these little works of art. He also had a display of larger pieces that I had to appreciate, and convince myself that I couldn’t buy on this trip (although I honestly almost cracked when it came to a Rescue Rangers piece). I knew what I wanted, and I was relieved that he still had them. I did not get to speak with Tad for as long as I would have liked, but like I said before he was very busy. Next I had the pleasure of FINALLY meeting Aaron Sparrow. Aaron missed out on Dragon Con last year, and my DW crew signatures collection has never felt complete (even though I was able to purchase a pre-signed copy of Tales of the Duck Knight). He has always been enjoyable online, and I was glad to finally meet him. Aaron Sparrow is one of those creators who loves what he does, and really wants to see the industry thrive. He had a smile on his face while he signed all four of my comics. Comic and Pop Artist Alley was a success! I picked up some great mementos, and had some really great experiences with some of my favorite creators. Oh! and I ran into a fellow Freedom Reborn alumni, Peter Nguyen. I had seen his name listed on Dragon Con’s website and I was excited to meet him He started interning at Marvel when we were active on the FR boards and it was the first time I had met someone from those boards! Peter works with Marvel and DC and he had some amazing prints for sale. I was already over my budget, but I hope he’s at DC again next year, and I am going to make sure some of his art is in my budget. I was hoping to make it to a Star Wars Rebels panel before the Darkwing Duck Panel, but that wasn’t possible. Instead I found my way to the hall where the DW panel would be and grabbed a spot in line. I was surprised and glad to see that there were already people waiting on the panel. I was able to grab a seat on the floor and enjoy some nourishment for the first time since before I parked my car. It was also one of the few times I had an opportunity to check-in online. While waiting for the panel and after I had an opportunity to meet a few people who knew about our podcast and website. 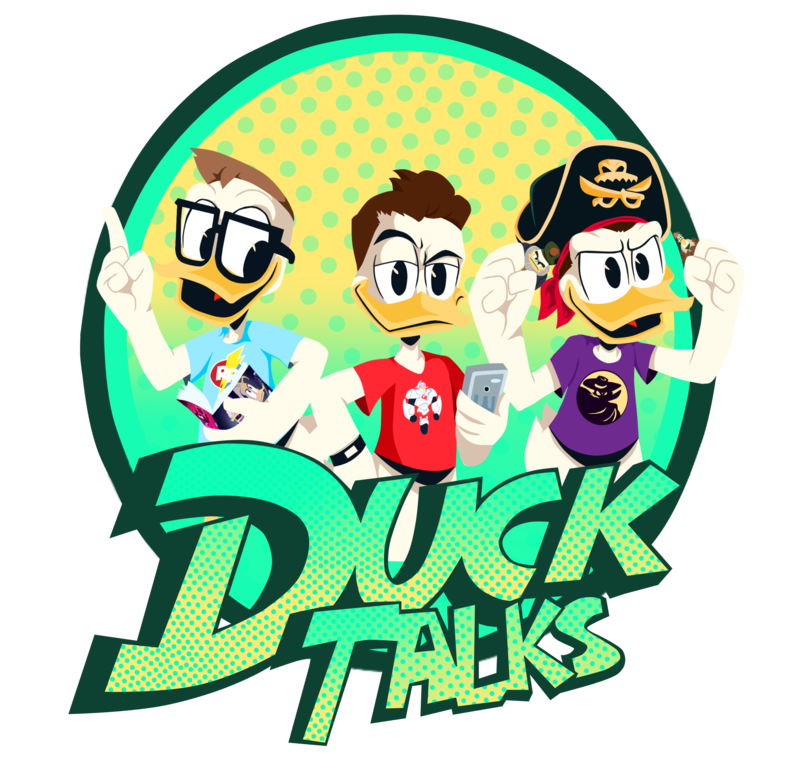 I hope that next year we might plan a meet up or panel for DuckTalks. The panel itself was a lot of fun. I was able to grab a seat in the front row because I was one of the first in the room and happened to catch one open. Dragon Con’s Animation Track put on a fun panel and did a great job. They introduced all three guests and asked each of them questions. Tad apparently loves convention panels and told so many great behind the scenes stories… it was great. Sparrow and Silvani also shared a few behind the scenes stories about the recent comic (including some of the plans for the future of the book had it not been cancelled, Nega-Gizmoduck!). I tried to record audio from the panel, but it wasn’t great. Thankful Aaron Sparrow was able to livestream the panel, and you can watch that video below. After the panel I had hopes of making it back to Comic and Pop Artist Alley, but they closed the doors as I walked up. With that my time at Dragon Con had come to a close, and I headed back to the MARTA station. As I prepared for my long drive home I was very disappointed that I couldn’t stay for another day. Dragon Con is an amazing experience, and I look forward to returning next year. Let us know if you have been to Dragon Con or if you are planning on attending next year. We are seriously considering partnering with the Podcast Track and possibly the Animation Track to host a panel or at least a meet-up. I hope you enjoyed reading about my experience, and I would like to thank everyone at Dragon Con who helped host such and amazing fan convention. Previous More Info On IDW’s Disney Afternoon Giant!